The Hawaii climate consists of essentially two seasons: winter and summer. Winter months (November through April) are warm, with daytime highs usually getting up close to 80°F (27°C), and lows in the low to mid-60’s F (17-20°C). The coolest months are January and February. Summer months (May through October) are warmer, typically about 4-8 degrees warmer than winter. The hottest months are July, August and September when daytime highs average in the low-80’s F (high-20’s C) island-wide. Despite receiving considerably less sunshine on average, temperatures on the east side of the island tend to be only a few degrees cooler than the sunny west coast. The most significant temperature drops come with gains in elevation. Temperatures on the summits of Mauna Kea Volcano and Mauna Loa Volcano can dip below freezing at night during the winter, with winter daytime highs around 40°F (4°C). Summer daytime temperatures can soar to nearly 60°F (15°C) at the summit of these volcanoes. 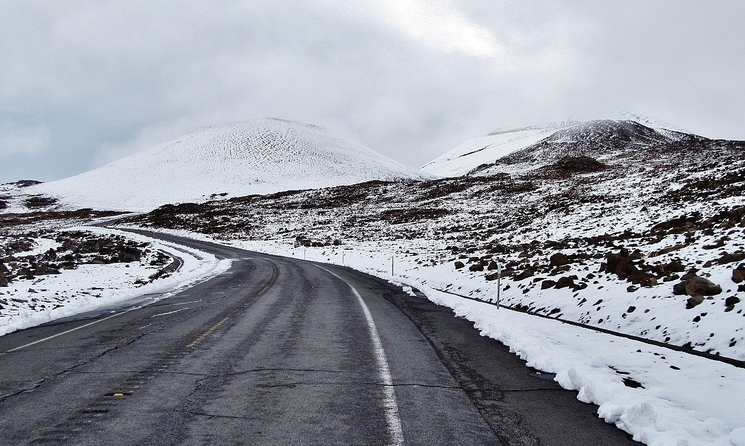 Occasionally winter cold fronts will bring blizzards to the upper elevations of Mauna Kea and Mauna Loa. Icing can occur near the summit and at times the snow level extends below 9,000 feet (2740 meters). 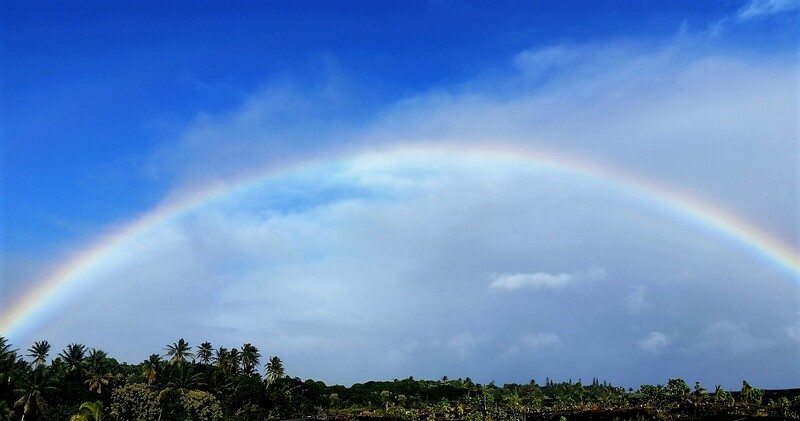 While Big Island weather can change dramatically from one day to the next, climate is generally defined as prevailing weather patterns in an area over an extended period of time. The Hawaii climate is rather unique. No place on earth has as much complex climatic diversity in such a small area as the Big Island. 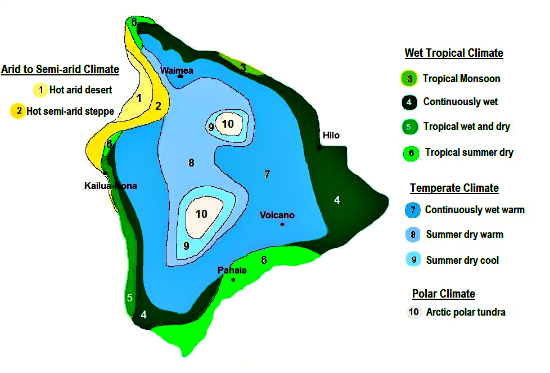 With 10 different climate zones, conditions vary dramatically from one part of the island to another. You will find everything from tropical rainforest in the east to arid, sun-drenched desert north of Kailua-Kona along the Kohala coast, temperate zones inland throughout the island, arctic polar tundra at the summits of Mauna Kea and Mauna Loa, and everything in between. It is interesting to note that Kona is the only place in the entire state of Hawaii that receives its high rainfall during the summer months. Characterized by wet summers and dry winters, this Tropical Wet and Dry climate zone runs mauka (toward the mountains) south from Kona along the west coast. Wherever you travel on the Big Island, be prepared for lots of sun. Even on days when the sun is obscured by clouds, the UV rays are still going to find you. And due to our proximity to the equator, the effect is more intense. Cover up! Wear plenty of sunscreen, a hat, and light clothing, preferably something that has SPF protection built in. Should you happen to get sunburned, the most soothing remedy is fresh aloe, cut directly from the local plant and applied to the burn. Again due to how close Hawaii is to the equator, the length of a day varies only slightly throughout the year. The longest day of the year is about 13.5 hours long, and the shortest day is about 11 hours long. And if you are accustomed to swimming in the Pacific Ocean along the west coast of the United States, you are in for a refreshing treat. 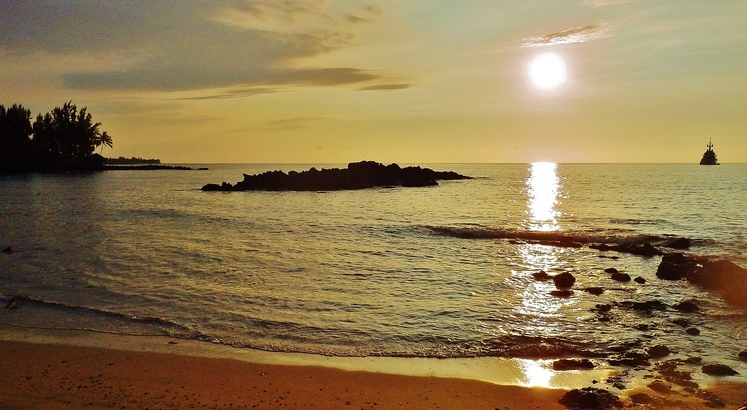 Our Hawaii climate means warmer, wonderfully pleasant ocean temperatures. Depending on the time of year, it fluctuates between 75°F and 82°F (24°-28°C).